Do you have a persistent slice that just won't go away? Struggling to improve your technique? Check out our time tested tips and tricks to a better day on the links. Marty's tip of the month will help you take your game to the next level. Need to gain that competitive edge? Each month Marty will provide an in-depth tip on topics ranging from the mechanics of the proper swing to perfecting the flop shot. Sometimes what you do off the course can have as much of an impact on your game as what you do on it. Check out the health and nutrition section to find hints for a stronger, leaner and more flexible physique. Your physical condition translates directly to your success on the course and Marty will show you how to feel and play better. It is my objective to have each student return the clubhead back to a square position at impact. 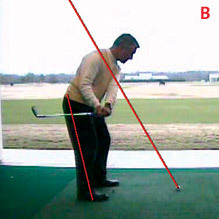 However, there are two other factors that are also important, the correct swing path and the proper angle of approach. So when you think about hitting a golf ball, it's all about paths and angles. We must therefore talk about the correct takeaway. You see, the there are two kinds of games you can play. One is called an on-line game such as bowling or croquet. In these games you stand on the line and make a motion that is straight back and straight through on a vertical up and down path. The other game is a side-on game such as golf and baseball. To hit a baseball you stand to the side of the ball and just make an around swing. But to hit a golf ball, which is positioned on the ground and you are standing to the side, there must be a motion that has some around and some up and down. It is the blending of the two that makes golf so challenging. Therefore, we must start by directing the club, hands and arms on the correct path to accomplish this blend. We are only going to talk at this time about the backward path called the backswing. The arms, hands, shaft and club head must be directed on the proper path by the upper left side to achieve the correct backswing. 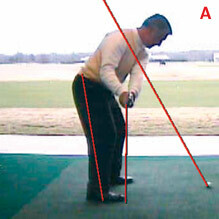 The culprit in the golf swing is the right side overpowering the movement at the wrong time. To minimize this wrongful intervention, each golfer must swing the club on the correct path to the top. I call this path the Swing Plane Zone (SPZ) as illustrated. When the shaft of the club first reaches a point on the backswing that is horizontal to the ground, the hands, arms and clubhead should be in a straight line inside the SPZ as illustrated (SEE IMAGE A). At this point in the swing if you draw a perpendicular line from the hands to the ground, this line should fall somewhere between the right toe and the middle of the right foot. 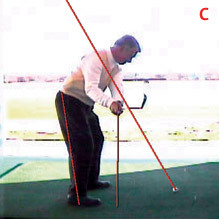 When the shaft and clubhead ventures inside of the SPZ, this will cause a lifting of the arms and the flattening of the shoulders resulting in the arms being on a much more vertical plane than the shoulders (SEE IMAGE B). However, if the arms continue to follow the rotation of the shoulders you end up with a swing that is below the plane and too shallow. The exact same scenarios can occur if the shaft and clubhead venture outside of the SPZ (SEE IMAGE C). What we are trying to avoid is a two-plane swing whereby the arms and shoulders are on different planes. They should both be on the same plane for the most consistent ball striking because this is what all the great players have done. Remember, we are only talking about the first 3 or 4 feet of the backswing to accomplish the correct position. If the left shoulder triggers the backswing at a 90-degree angle to the spine and the hands stay close to the right thigh with the shaft and clubhead remaining slightly in front of you, the correct position will be accomplished. 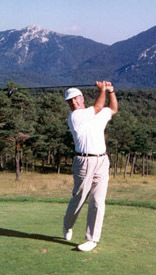 The golf swing has three parts: a backswing, a forward swing and a finish. We are only focusing on the takeaway at this time in order to help create the proper path and angle. Wouldn't it be nice if the exact start produced the correct backswing that in turn caused the forward swing to be a perfect happening. Because the fewer things a golfer has to think about once a motion has started the more enjoyable this game becomes. Quality instruction insures consistent ball striking and scoring. Good health and nutrition provides for maintaining a high energy level and having a daily work-out routine can prevent golf injuries related to backs, elbows, wrists and shoulders. Setting aside 15-20 minutes a day can prevent many injuries in golf.